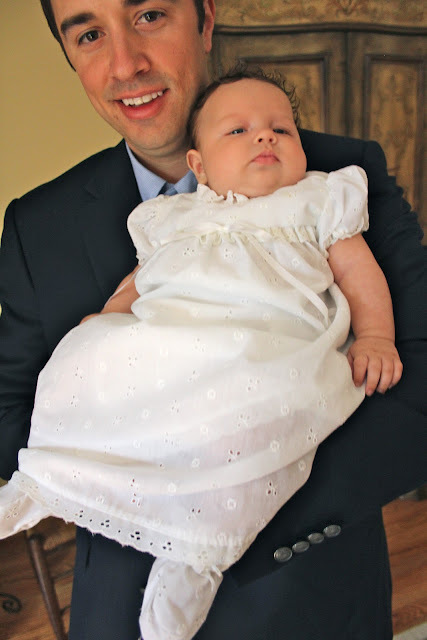 Our sweet daughter was baptized this past weekend in Kansas City surrounded by family and friends. We couldn't be more proud of being Maggie's parents if we tried. She has been such a blessing to us, and we couldn't wait for the day that we could dedicate her to our Lord and Savior. We were beaming all day. Ryan took Maggie on a walk the day before to explain to her what it meant to be baptized and to let her know how much God loves her. It was such a sweet moment. She wore the same dress I did when I was baptized as a baby. My Godmother, Pat, was the one that bought it for me, and she was able to see it worn twice! The baptism was held at Leawood Presbyterian and pastor, Ryan Kapple, performed the beautiful ceremony. He was my youth pastor back in the day at Colonial Presbyterian! I had to hold back tears the whole time! She did so good! I was a little nervous as she has been extra fussy as of late. We promise, baby girl, to raise you to know and love your loving Father. Afterwards, we had a small get together at my mom's house to celebrate this big day. 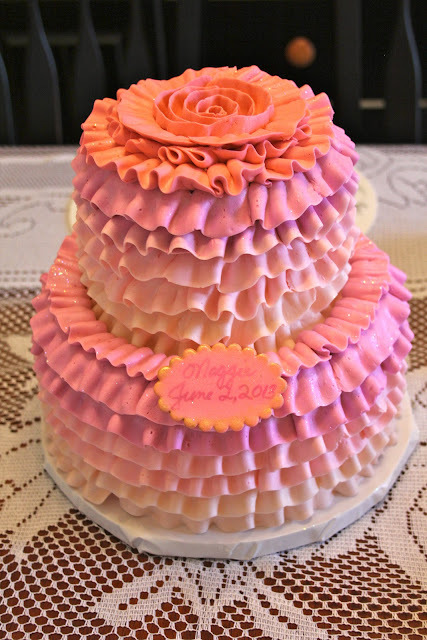 The cake was made by the same lady that made our wedding cake. Yum! 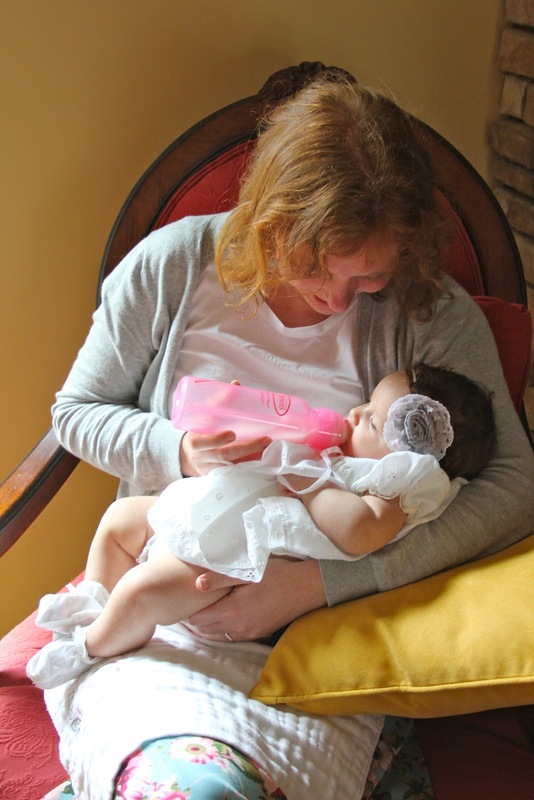 Aunt Sally feeding her niece. 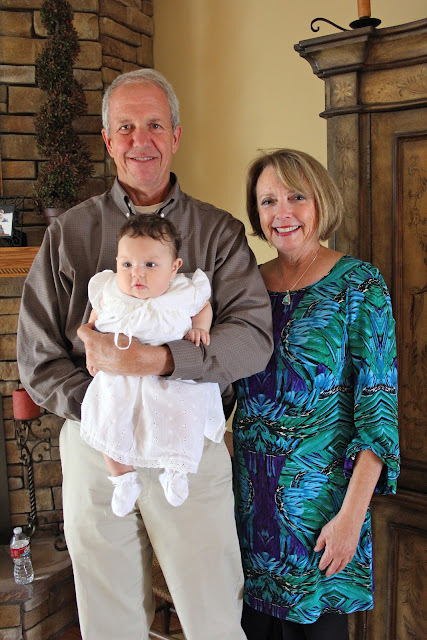 Proud Grandparents. I love this picture of Maggie too! Rocky & Pat (my Godmother) jumped into this picture with us. They came up all the way from Dallas to meet Maggie. We are so thankful they were able to come. We are grateful for you two, and Maggie's lucky to have you in her family! Guys shot including our friend Brad. Our friend, Emily, made it too but I didn't get a picture with her. Kisses, spit up and all! What an important and special day! You look fabulous! I love that Maggie wore the same baptism dress as you, what a special memory for both of you someday. As always, your family looked beautiful. goodness, what a little sweetie! Such an important day. Looks like you had a fun little celebration!